In an effort to encourage shopping during a slow season, and to partner with The Brookside Farmers Market which brings in unique customers weekly, we created Brookside Market Days. This event occurred every Saturday, August through September, and encouraged Farmers Market attendees to stay in the Brookside area after picking up their fresh veggies and shop at local Brookside businesses. Increase foot traffic and reach potential customers that attend the Farmers Market in the Brookside area to shop and dine on Saturdays. 1. 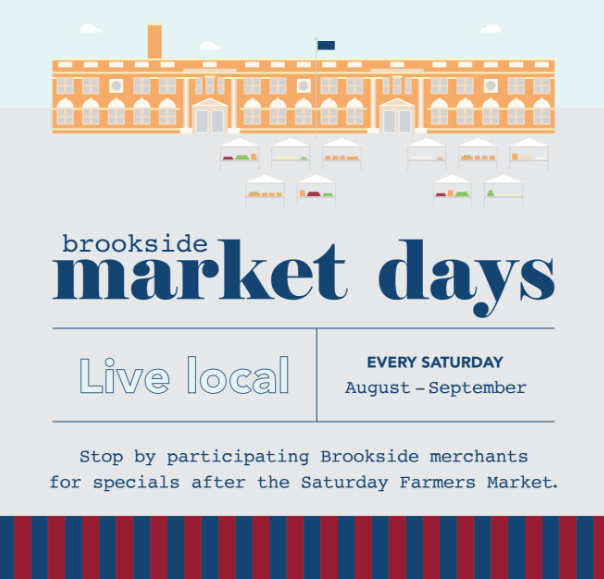 Brookside area merchants and restaurants are teaming up with the Brookside Farmers Market throughout August and September to offer discounts, sales and events to those visiting the Farmers Market. 2. In its inaugural year, Brookside Market Days is an effort to encourage patrons to “Live Local.” Local merchants and restaurants will be hosting events, offering specials and more throughout August and September in collaboration with the Brookside Farmers Market through Brookside Market Days. The Brookside Market Days Facebook event reached 9,123 people and earned 881 responses. Throughout August, overall post reactions on the Facebook page increased 17% and increased 52% throughout September. The lifetime post total reach of BKS Market Days posts was 21,640. Impressions reached 34,147 users. In total, 377 users engaged with Brookside Market Days content. Sales increased 10% over last year for the August-September time period.